1. 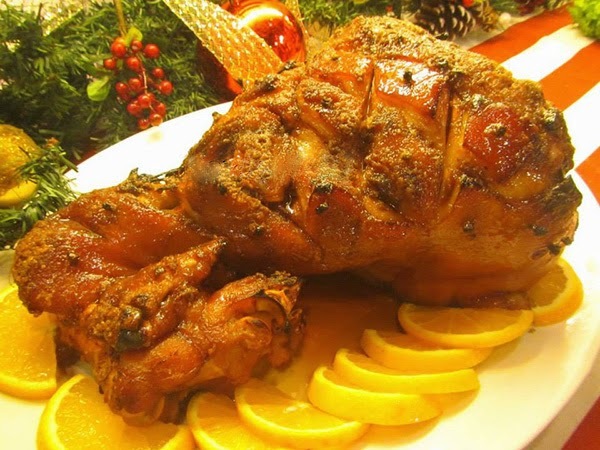 Boil pork in Pineapple juice, sugar, salt and gin until soft. 2. Let it cool for a few minutes then put ham in a baking tray. 3. Insert cloves alternately into the ham net markings. 4. Make pineapple-brown sugar glaze by mixing brown Sugar, mustard and Pineapple Juice in a sauce pan. Stir until sugar dissolves. Bring it into a boil and simmer until thick. 5. Brush ham with glaze and bake into the oven at 300ºF until bubbly and a little brown.